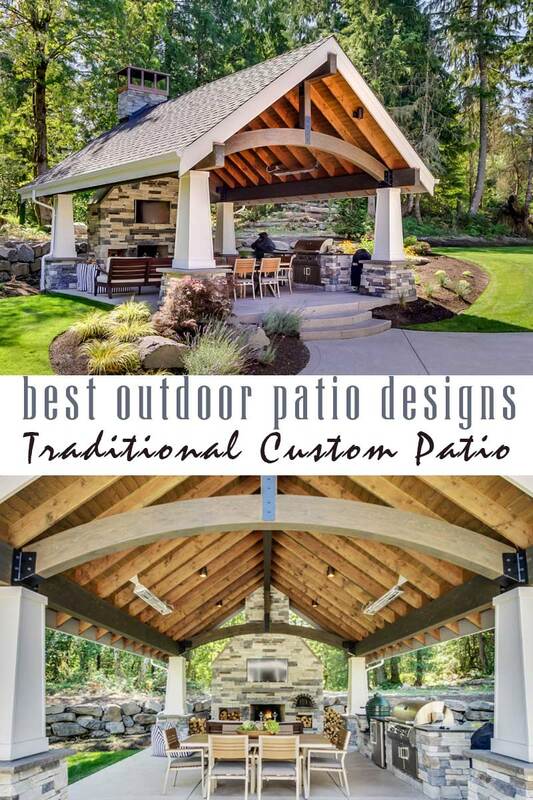 Are you looking for best backyard patio design ideas to inspire your next project? 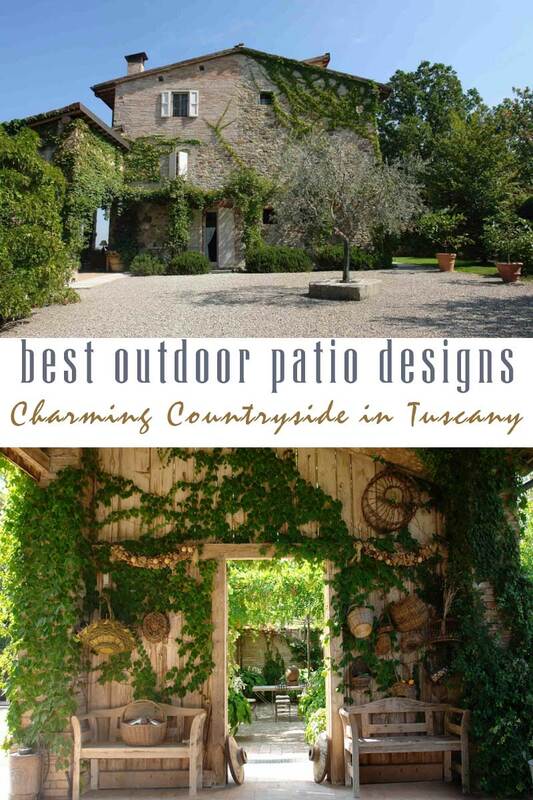 Outdoor spaces play an important role in our lives, either it is a small urban patio or a sprawling estate. Embracing nature is good for our mental and physical wellbeing. Gardening, playing games with the kids outside, hosting a pool party, tending to a small backyard fruit garden, enjoying a quiet evening by an open firepit – all these activities are essential for our R & R. But besides relaxation, having an outdoor retreat also adds value to your property: upwards of 80% of homebuyers said patios and front porches are “essential” or “desirable,” according to the “What Buyers Really Want” survey from the National Association of Home Builders. What can you do to liven up your home’s outdoor space and lift up everyone’s spirit in the process? How can you design and create a low-maintenance space which is great for both family time and entertaining guests? Whether you are looking for inspiration for a quick weekend DIY project or a major landscape overhaul, planning is the key. 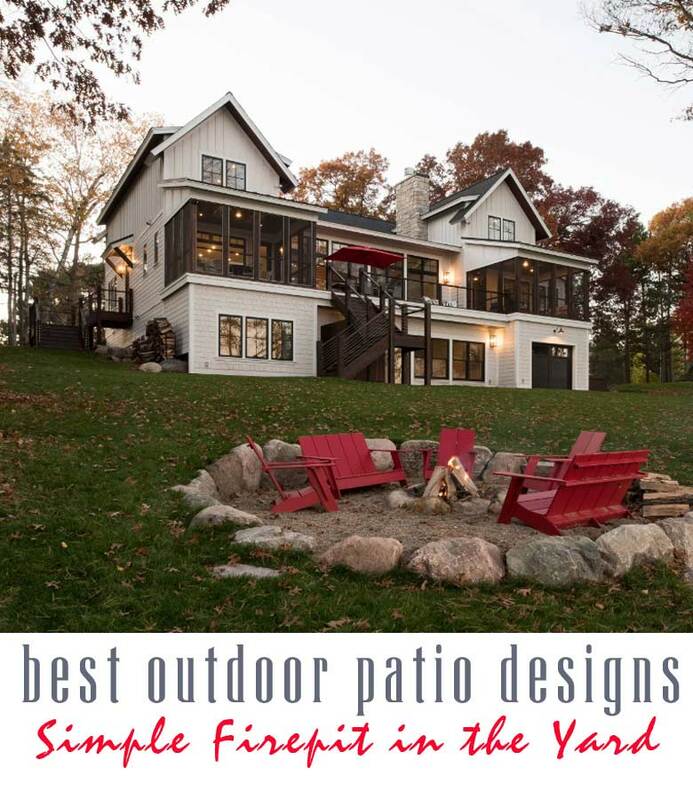 What are the latest trends in backyard patio design? Experts suggest going overboard on comfy by creating a backyard oasis with comfortable and inviting outdoor seating, hammocks, and splurging on some soft and colorful cushions for your patio furniture. There are so many great choices for comfortable outdoor furniture from basic to luxurious! if you a handy person who would rather ‘do it yourself’ check the fabulous tutorials for an easy woodworking project that will help you with anything from a hanging bed to folding picnic table. Improve the flow of your living space by creating a seamless transition between your home’s interior and backyard. Replacing a standard door opening with sliding glass or French doors will give your home a wow effect and invite outdoor light in, brightening your interior. 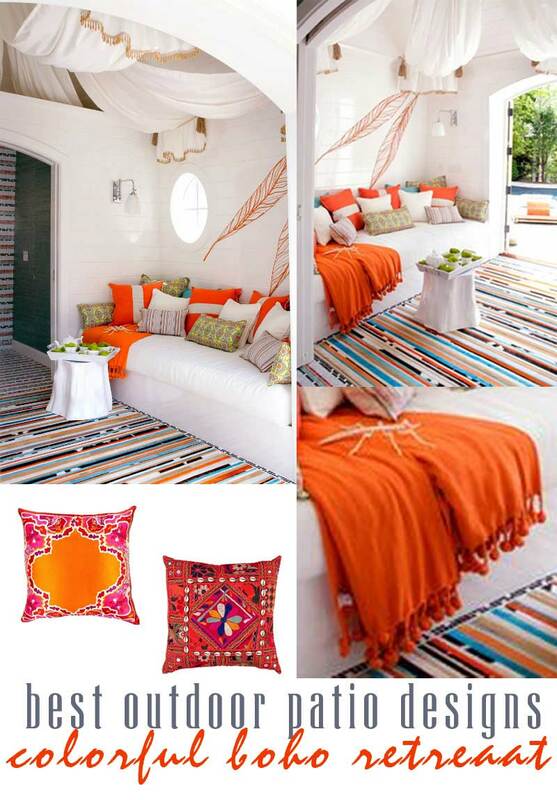 Use the same color theme on the patio as in the room leading to your backyard for a continuous effect or use a splash of color for boho artistic effect. Outdoor lighting dresses up your home at night and makes it a safer environment while making it possible for you to spend more time outside at night. Use uplighting to achieve a dramatic effect while highlighting trees, architectural details, or other focal points. Add sconces or pendant lights to make evening entertaining, grilling, and swimming more enjoyable. There are many solar options that are easy on the budget and add green features to your home. Illuminate walkways, rails, and steps with landscape solar lights, and hang fairy or string lights to set an enchanting tone. There are many clever DIY projects to add light to your backyard in style and on a budget. A fire pit will magically draw friends and family together and add instant ambiance. What can be more magical than a warm summer evening by the fire under the stars? Check numerous tutorials on easy-to-make DIY firepits on a budget or purchase a kit from your local home improvement store. Never ignore basic safety rules as fire in your backyard should never be a hazard. Make sure there are no tree branches in close proximity and always have a water hose and fire extinguisher ready when you lit the fire. We have searched the best outdoor patio ideas – from a low-maintenance urban paradise to rustic countryside – to give you an inspiration for your next outdoor project. What if your idea of the best outdoor landscaping is a combination of an organic garden with benches and a waterfall? That’s what a professional landscaper created in his own backyard. The design is flawless as it eliminates many potential problems that gardeners may experience: it is fenced so wildlife can’t get in and eat your crops, raised beds are surrounded by pebbles which takes care of the weed and bugs infestation problem, and it has a beautiful water feature which becomes handy if you need to water some seedlings. Perfect! Love this colorful backyard patio design by the pool full of light and tasteful artistic accents! With simple design of white-washed walls and draped high ceiling, all the accents add life and interest to this simple space. If you are a crafter, you can even crochet your own throws and pillowcases to cozy up your favorite place to spend lazy days of summer. This a great idea for a small backyard patio on a budget as you can DIY most of the decor accents or purchase them inexpensively. What if your backyard is a narrow space between the walls in an urban setting? This is a perfect low-maintenance solution for those who don’t want to mow their grass or pull weeds. 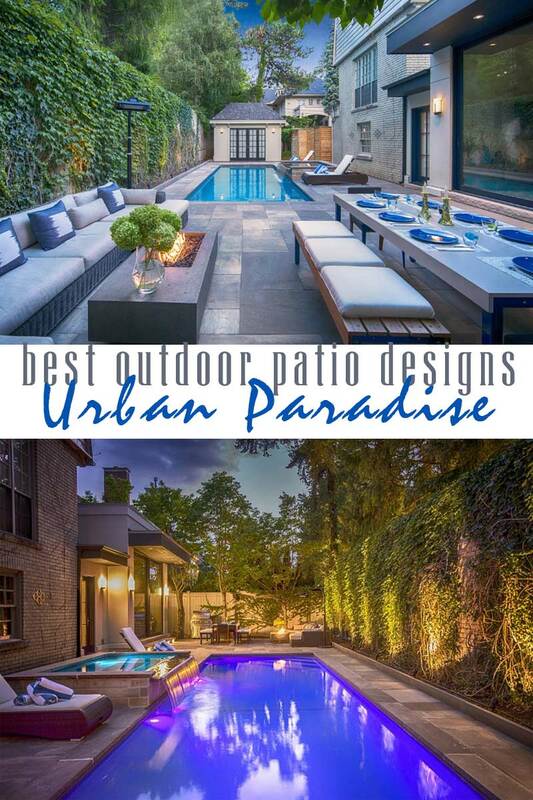 An urban paradise with a pool, spa, waterfall, fireplace and comfy seating is perfect for summer dinner parties with friends or a lazy morning to relax after a busy week. With all the added lighting, this patio is as perfect during the day as it is at night. It is amazing how much a small outdoor patio can offer you when it is well-designed as gorgeous backyard living space with a fiberglass pool, in-ground spa, linear fire fireplace, and ample landscape lighting! If this is your idea of relaxation, create a broadband backyard paradise by adding a flat screen to watch a game by the pool and it will become your favorite place to hang out with family and friends. 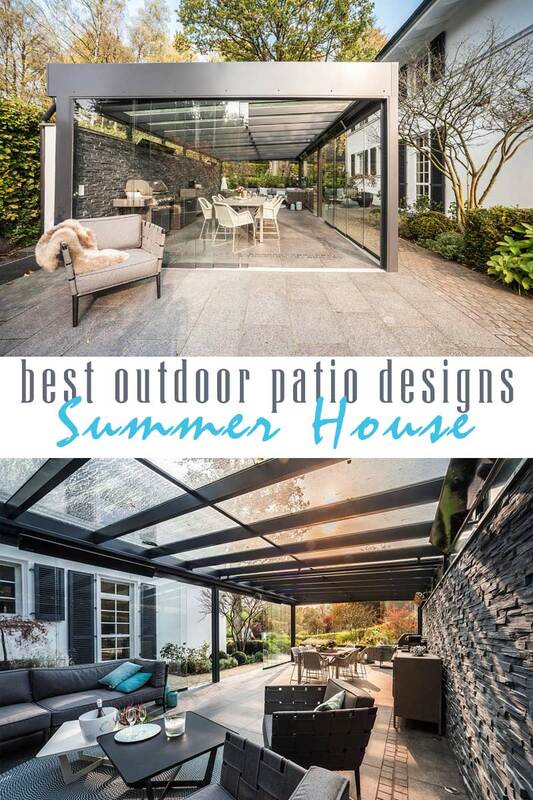 This is one of our favorite ideas for the best backyard patio designs – a simple glass summer-winter house that can be as closed or open as the weather allows. What a beautiful place to have a relaxing grilled dinner with family after a busy day or sip a glass of champagne in the evening while star-gazing! The glass walls make this construction light and almost invisible by inviting outdoors in and bringing your living space out while protecting you from the elements. Simply genius implementation of a small and functional narrow urban patio design! Do you have a very small backyard crammed between the walls? You can still have a backyard of your dreams with lots of privacy. 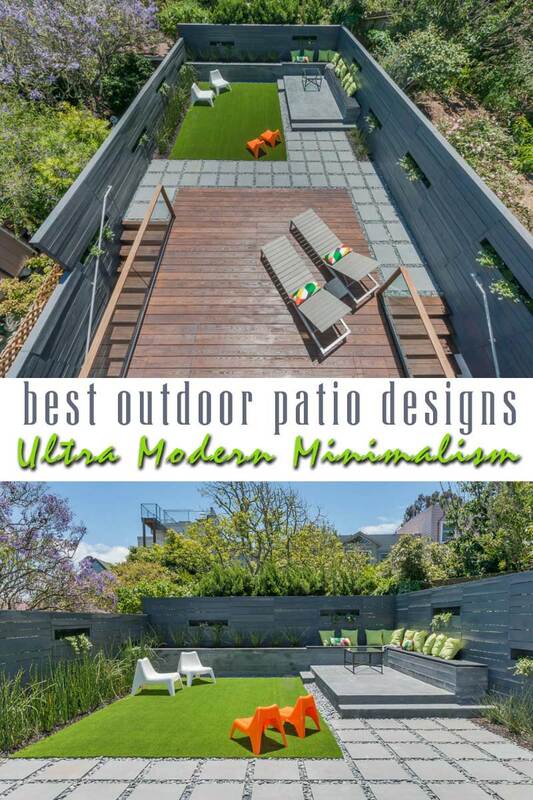 Check out this ultra-modern minimalistic approach to backyard living! A small patch of grass with drought-tolerant landscape gives you a slice of nature which you can enjoy with ample comfortable seating space (that doubles as storage for toys and outdoor equipment) by the perimeter of the walls. A combination of grass, wooden patio, concrete pavers, and rustic walls creates an interesting space that is both modern and enjoyable. Plenty of sunshine in that backyard though maintenance is at a low minimum. If you have a backyard with a view of the lake or mountains and just want to enjoy nature outdoors in all its untamed beauty, a simple backyard firepit may be a great solution. It gives your backyard a focal point and allows family and friends to gather around it while leaving plenty of space for a game of ball or frisbee. It is a budget-friendly approach to backyard design as it requires a very minimal investment of time and money. There are plenty of DIY firepit ideas on Pinterest with step-by-step tutorials and list of all necessary materials. This can be a quick weekend DIY project that you’ll enjoy for years to come. 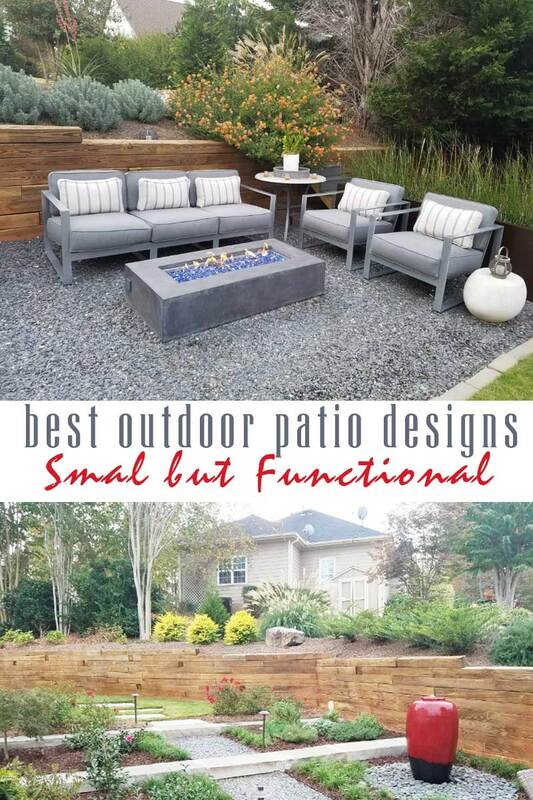 With our busy lives and family obligations, it is perfectly normal to have a small, low-maintenance backyard which is aesthetically-pleasing and functional. A narrow gas firepit with well-designed seating space is all you need to enjoy your backyard and relax after a busy workday. Using decorative stones for backyard patio design has been a growing new trend due to water restrictions in drought-stricken regions and overall desire of homeowners for a low-maintenance, budget-friendly landscape. A simple water fountain, solar lights eliminating stone paths at night, and a few decorative plants make this backyard patio both functional and charming. Sometimes you have a perfect countryside setting, rustic old house, and a charming courtyard that just doesn’t need any drastic modern improvements. This old Italian house in Reggio Emilia has it all – views are endless, stone walls and traditional stone front yard with old olives trees bring plenty of charm while backyard features overgrown vines that provide much-needed shade. With just two symmetrical wooden benches and a whimsical display of antique baskets, this masterpiece is complete. Looking for best modern outdoor backyard patio design ideas to inspire your backyard remodeling project? This kitchen – outdoor patio has it all. With rustic wooden beams, BBQ grill and stone fireplace/pizza oven combination, this outdoor space is both inviting and functional. It will be a great family gathering place, protecting everyone from the rain yet providing a perfect setting to enjoy the greenery. Great place to entertain guests and definitely worth the investment! 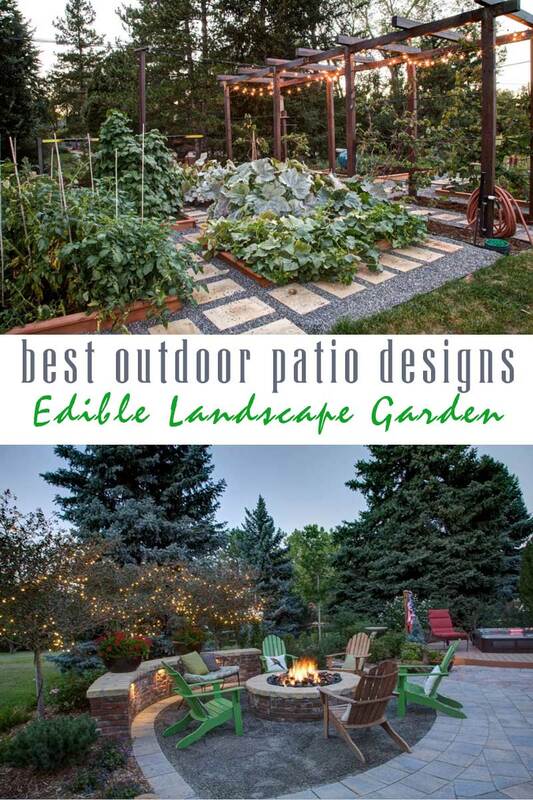 Edible landscape trend is rapidly gaining popularity as homeowners are tired of spending money on watering just grass. There are even communities of new homes that implement micro-farming instead of traditional decorative landscaping. Why not try it in your own backyard? Swiss chard, kale, rosemary, and other herbs and vegetables will not only diversify your cooking palette but also make the air in your garden fragrant and pleasant. In this featured backyard, there is plenty of room for raised beds as well as a relaxing patio space with fireplace seating to rest and enjoy the evening. Prefabricated Tiny Homes Can Be Awesome and Beautiful!